What if your old cabinets are not sturdy enough to handle being refaced? What if your kitchen needs a whole new layout to make the space a more efficient work space? 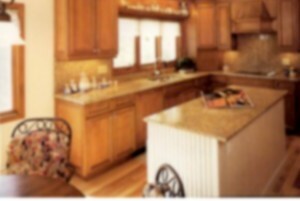 Our line of custom kitchen cabinetry will provide solutions for your kitchen space. Remove the existing kitchen, dispose of it, or give it a second life by donating it. Install new custom built cabinets made specifically for your space, and finish with the necessary finishing details. A new kitchen in North London. Granite countertops, glass doors and a bead-board backsplash transformed this kitchen into the favourite room of the house.